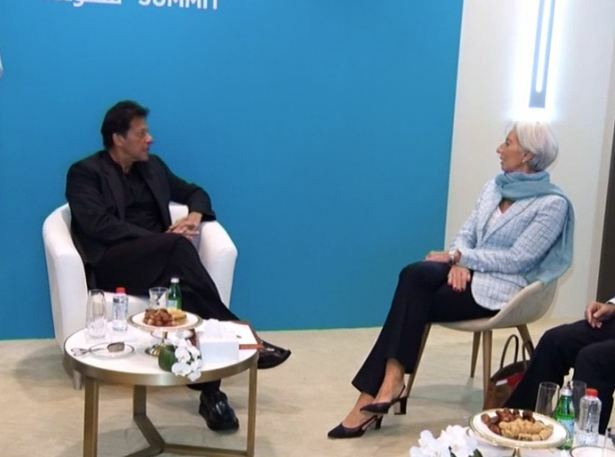 ISLAMABAD, Feb 10 (APP):Prime Minister Imran Khan Sunday had a meeting with Managing Director of the International Monetary Fund (IMF) Christine Lagarde on the sidelines of the World Government Summit in Dubai. The prime minister appreciated the IMF’s support to Pakistan and shared his vision for nation-building, according to a press statement issued by the Ministry of Finance here. She said the IMF would remain engaged in supporting Pakistan in sustaining its economic recovery, the ministry statement added. In this regard, deliberations between Pakistani authorities and IMF staff would continue to finalize an agreement on the contours of a programme, it added. In a statement issued by IMF on the meeting, the IMF chief said, “I had a good and constructive meeting with Prime Minister Khan, during which we discussed recent economic developments and prospects for Pakistan in the context of ongoing discussions toward an IMF-supported programme. “I reiterated that the IMF stands ready to support Pakistan. I also highlighted that decisive policies and a strong package of economic reforms would enable Pakistan to restore the resilience of its economy and lay the foundations for stronger and more inclusive growth. As emphasized in the new government’s policy agenda, protecting the poor and strengthening governance are key priorities to improve people’s living standards in a sustainable manner,” she added. The prime minister, along with a high level delegation, arrived in Dubai earlier in the day to attend the international event, at the invitation of Vice President and Prime Minister of the United Arab Emirates and Ruler of Dubai Sheikh Mohammad Bin Rashid Al-Maktoum. During the visit, the prime minister was accompanied by Foreign Minister Shah Mahmood Qureshi, Finance Minister Asad Umar, Maritime Affairs Minister Syed Ali Haider Zaidi, Adviser to PM on Commerce Abdur Razak Dawood and Special Assistant to PM on Reforms Dr Ishrat Hussain.